Caramel is a delicious treat in which sugar is heated, breaks down and turns into delicious caramel with a rich golden color and iconic flavor. Caramel is delicious plain or caramel apples are delicious, as well. Not to be confused with National Chocolate Caramel Day on March 19th, which focuses on chocolate and caramel, this day is all about caramel. No chocolate included. April 5th. Same day every year. 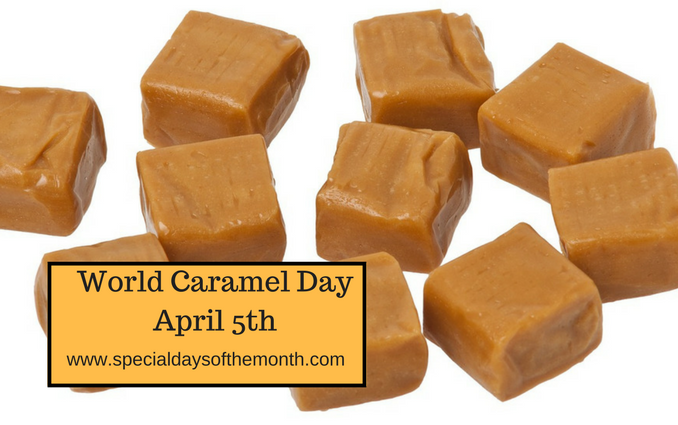 How is Caramel Day celebrated? This day can be celebrated by sharing it in different forms with friends, family, and co-workers. You can prepare little bags of mixed types of caramel, with little cards that talk about the history of this delectable treat, and perhaps with a recipe for them to try making their own at home! Prepare an easy caramel recipes such as caramel corn or caramel-filled chocolate cookies. Milton Hershey’s first business was the Lancaster Caramel Company! The famous Turtle candies, with rich droplets of caramel, are made with pecans dipped in chocolate. Caramel makes a great ice cream topping, a candy filling, or on its own. You can also find caramel flavored puddings, popcorn, desserts, and coffee. Caramel is really a versatile topping, able to go on top of any form of fruit, be they pears, peaches, or the traditional apples.